One of the best things I have ever found on the internet is the amazing Political Compass. Basically put the website is a set of questions that are used to place you in a graph that shows if your politics are left or right and more importantly if you are authoritarian or pure liberal. I have been using it for years and have been tracking any changes to my outlook now I am near the end of my travels. Normally, I come out in the top right of the green square, basically a left leaning liberal type best identified with Gandhi in politics. Now I have moved even further south. Perhaps it is the effect of visiting India and China? Or is it as I grow older? Perhaps it is the mental jump from leaving my job in London? Whatever the reason I accept the changes, I have been through some changes of the heart as well as the mind and of course my politics would move as well. 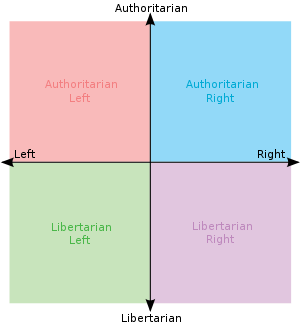 From WIKI: The underlying principle of the Political Compass is that political views may be better measured along two separate and independent axes. The Economic (Left-Right) axis measures one’s opinion of how theeconomy should be run: “left” is defined as the view that the economy should be run by a cooperative collective agency (which can mean the state, but can also mean a network of communes), while “right” is defined as the view that the economy should be left to the devices of competing individuals and organisations. The other axis (Authoritarian-Libertarian) measures one’s political opinions in a social sense, regarding a view of the appropriate amount of personal freedom: “libertarianism” is defined as the belief that personal freedom should be maximised, while “authoritarianism” is defined as the belief that authority and tradition should be obeyed. See how I have moved? Where do you come out?